Préface : Frédéric Abécassis et Karima Dirèche, Bibliographie publiée à l’occasion de la tenue du colloque internationale Migrations, identité et modernité au Maghreb à Essaouira, les 17 - 20 mars 2010. Cette bibliographie propose un état des lieux des études menées sur l’histoire des juifs du Maghreb et de l’Espagne musulmane (al-andalûs). Près de 3000 notices d’ouvrages écrits principalement en langues française et arabe (mais également en anglais et en espagnol) offrent un tableau exhaustif des travaux et des recherches sur le judaïsme de l’Occident musulman. L’approche thématique (linguistique, littéraire, artistique, économique, religieuse, identitaire, idéologique et politique) et géographique (espaces nationaux et régionaux) rend compte remarquablement de la diversité et de la richesse de ce champ. لنص الحالي لمؤتمر القي في مدريد يوم 26 مارس 2008 في نطاق برنامج منبر البيت العربي النص الأصلي باللغة العربية ترجمة ماجدة مكي. Índice de coexistencia Gallup 2009: un estudio global sobre las relaciones interreligiosas. Análisis sobre la integración de la población musulmana en Francia, Alemania y el Reino Unido. © de la presente edición en español: Casa Árabe e Instituto Internacional de Estudios Árabes y del Mundo Musulmán, 2009. El papel que desempeña la religión tanto en tiempos de guerra como de paz es objeto de uno de los debates más controvertidos de nuestra época. Políticos, expertos y mediadores se esfuerzan por comprender las complejas relaciones entre poblaciones con distintas creencias religiosas. Los conflictos políticos, cuando se dan entre grupos confesionales, pueden convertirse en conflictos religiosos, del mismo modo que las divergencias religiosas en el seno de una comunidad pueden convertirse en conflictos políticos. No obstante, incluso en este ambiente turbulento, existen ejemplos de coexistencia y buena voluntad entre grupos con distintas creencias religiosas. Mystique et politique chez Abdessalam Yassine et ses adeptes. Archives de sciences sociales des religions, 135 (2006) - Réveils du soufisme en Afrique et en Asie, [En ligne], mis en ligne le 16 octobre 2009. URL : http://assr.revues.org/index3790.html. Consulté le 03 mars 2010. Le pouvoir de l’écriture dans la magie. Les turuq balkaniques à l'épreuve de la modernité. Archives de sciences sociales des religions, 135 (2006) - Réveils du soufisme en Afrique et en Asie, [En ligne], mis en ligne le 16 octobre 2009. URL : http://assr.revues.org/index3777.html. Consulté le 03 mars 2010. Collection d'ouvrage numérisé portant sur le Droit musulman appartenant à la Médiathèque de la Maison Méditerranéenne des Sciences de l'Homme (MMSH) (Aix-en-Provence, FRANCE). Le Caire, Impr. nationale, 1894. The “Christian” Europe: the West, the East, the Balkans. The European and the National in the Balkans. The Role of Religion. "Law, The Rule of Law and Religious Minorities in Muslim Countries: The Case of Egypt"
Cahiers d'études africaines. Vol. 32, N°126. Berkeley: University of California Press, c1996 1996. Publisher's Description: Debate over the authenticity of "On the Jews" has persisted for nearly 1,900 years. Bezalel Bar-Kochva attempts to overcome this stalemate in his finely detailed and convincingly argued study that proves the forgery of the book and suggests not only a source for the text, but also a social, political, and cultural setting that explains its conception.Bar-Kochva argues that the author of this treatise belonged to the moderate conservative Jews of Alexandria, whose practices were contrary to the contemporary trends of Hellenistic Judaism. They rejected the application of Greek philosophy and allegorical interpretations of the Holy scriptures and advocated the use of Pentateuch Hebrew as the language for educating and for religious services. They showed a keen interest in Judea and identified themselves with the Jews of the Holy Land. 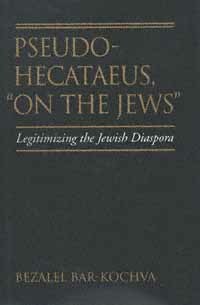 "On the Jews," then, was the manifesto of this group and was written at the peak period of the Hasmonean kingdom. Its main purpose was to legitimize Jewish residence in Egypt, despite being explicitly prohibited in the Pentateuch, and to justify the continued residence of Jews there in a time of prosperity and expansion of the Jewish independent state. Berkeley, Calif London: University of California Press, c1997 1997. 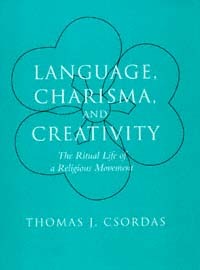 Publisher's Description: Thomas Csordas's eloquent analysis of the Catholic Charismatic Renewal, part of the contemporary cultural and media phenomenon known as conservative Christianity, embraces one of the primary tasks of anthropology: to stimulate critical reflection by making the exotic seem familiar and the familiar appear strange. This story, unlike an ethnography of a little-known tribal society, is about people who are quite like everybody else but at the same time inhabit a substantially different phenomenological world.Csordas has observed and studied Charismatic groups throughout the United States. He begins with an introduction to the Charismatic Renewal and a history of its development during the roughly thirty years of its existence. He describes the movement's internal diversity as well as its international extent, emphasizing Charismatic identity and the transformation of space and time in Charismatic daily life.Language, Charisma, and Creativity extends and builds on the ideas of self-transformation that Csordas introduced in his earlier book on Charismatic healing. This work makes an original, important contribution to anthropology, studies of religion and ritual, linguistic-semiotic and rhetorical studies, the multidisciplinary study of social movements, and American studies. University of California Press, 1990 Subjects: Classics | Classical Religions | Classical History | John, Bishop of Ephesus -- ca. 507-586 | Christian saints -- Middle East -- Biography | Jacobites (Syrian Christians) -- Biography | Asceticism -- History -- Early church, ca. 30-600 | Monophysites -- Middle East -- History | Transformation of the classical heritage ; 18 Publisher's Description: John of Ephesus traveled throughout the sixth-century Byzantine world in his role as monk, missionary, writer and church leader. 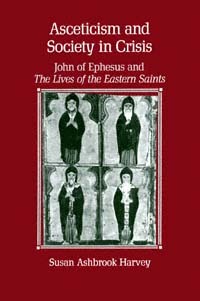 In his major work,The Lives of the Eastern Saints, he recorded 58 portraits of monks and nuns he had known, using the literary conventions of hagiography in a strikingly personal way. War, bubonic plague, famine, collective hysteria, and religious persecution were a part of daily life and the background against which asceticism developed an acute meaning for a beleaguered populace. Taking the work of John of Ephesus as her guide, Harvey explores the relationship between asceticism and society in the sixth-century Byzantine East.Concerned above all with the responsibility of the ascetic to lay society, John's writing narrates his experiences in the villages of the Syrian Orient, the deserts of Egypt, and the imperial city of Constantinople. Harvey's work contributes to a new understanding of the social world of the late antique Byzantine East, skillfully examining the character of ascetic practices, the traumatic separation of "Monophysite" churches, the fluctuating roles of women in Syriac Christianity, and the general contribution of hagiography to the study of history. Publisher's Description: Gasparo Contarini (1483-1542) was a major protagonist in the Counter-Reformation of the sixteenth century. A worldly Venetian patrician, he later became an ascetic advocate of Church reform and, as a Catholic cardinal, was sent to the important Colloquy of Regensburg. 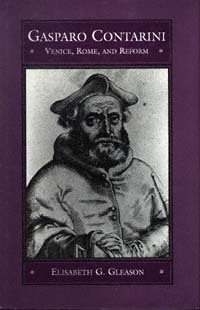 He failed in his mission to bring about an agreement between Lutherans and Catholics; nevertheless, his life and thought, as well as his friendships with the most vocal proponents of concord, peace, and toleration, make him an impressive and significant historical figure.In the first biography of Contarini since 1885, Elisabeth Gleason greatly broadens our understanding of the man and his times. As a result, scholars and students will come to see Cardinal Gasparo Contarini as a reminder of alternative concepts of authority and liberty in both church and state.